Instant ramen and just-add-water noodles are lifesavers because they are convenient and fast, but they are also usually chock-full of processed ingredients and unrecognizable pieces of dehydrated meat and vegetables. 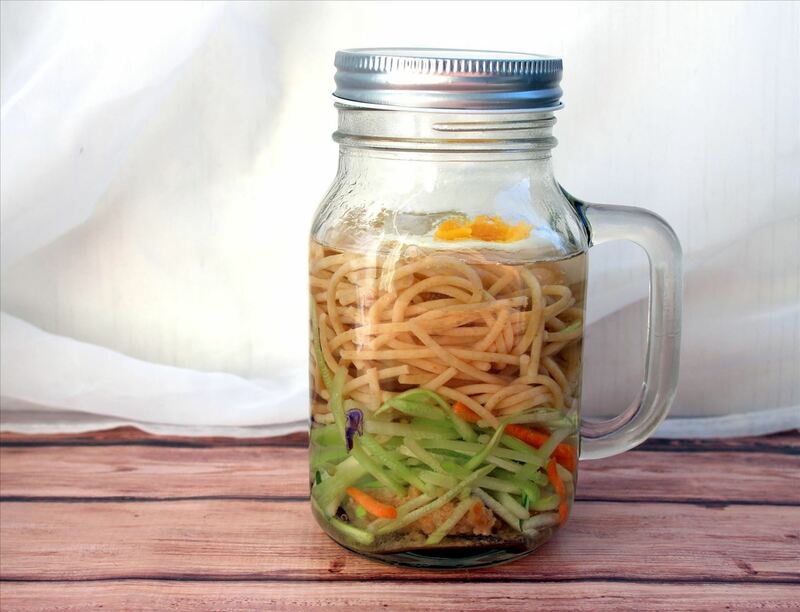 These DIY cups o' noodles are still portable and fast for BYO lunches, but they are also much healthier than their convenience store counterparts. They also actually taste good. I recommend using larger jars than petite mason jars; I used my jumbo-sized glass jars for the ones pictured here. 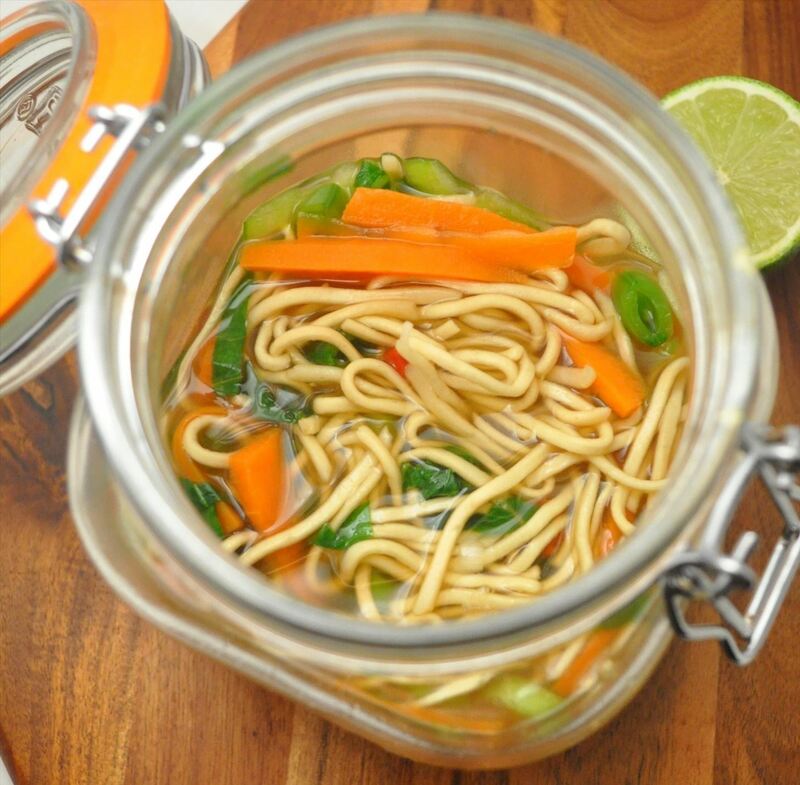 I have a healthy appetite, so most of the other homemade 'pot' noodles I see online or in food magazines are housed in tiny glass jars that already have me wishing for seconds. I tried to create a simple formula for instant noodles that you could use but that wouldn't be too much work. 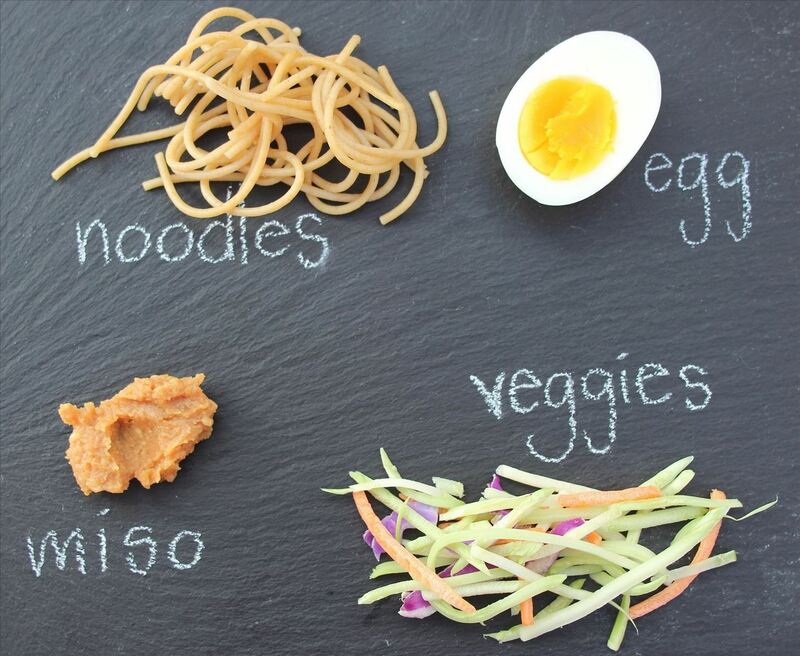 You can add to it and spice it up with whatever additional seasonings you wish, but even with just these four components, you'll have a tasty noodle soup for lunch. With this formula, your lunch possibilities are endless and exciting. Precooked Noodles: You can substitute almost any noodles here (as long as you cook them al dente), whether you use Japanese noodles like udon or Italian pasta like rotini. Good Soup Base: For ramen-type noodle bowls, I recommend Marukome miso pastes that already have a soup base added to them. For American or Italian-ish noodle soups, I recommend Better than Bouillon in any flavor (chicken, beef, or vegetable). Veggies: Choose veggies that you like to eat both raw or cooked. Depending on how long you let your soup steep, the vegetables might not cook through until soft. I recommend precut broccoli slaw (which has carrots, red cabbage, and broccoli), julienned carrots, spinach, and scallions. Instant wakame (seaweed) also works great. Protein: I like the ease of hard-boiled eggs or sliced chicken, but you can use meatballs, chickpeas, roasted turkey, or anything else you like or have in your fridge. 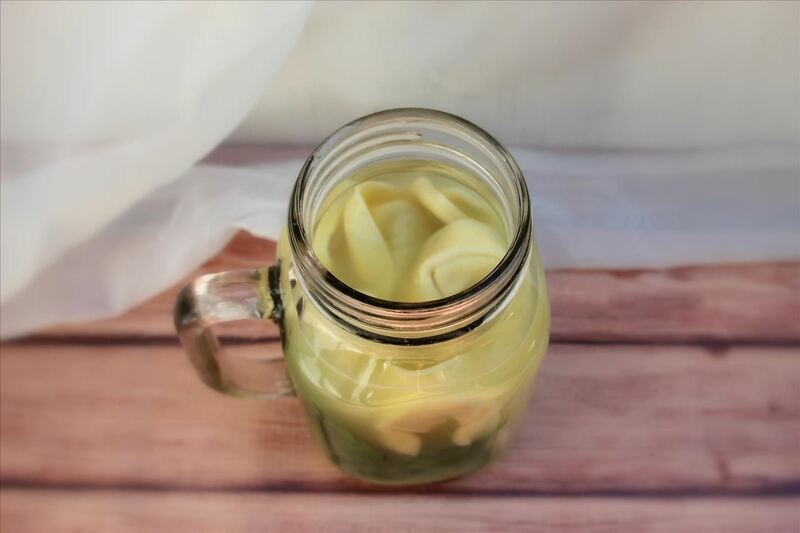 In general, these homemade cups o' noodles are a good way to use up some odds and ends that are hanging around in your fridge. You can use any type of noodles, but I used whole wheat spaghetti for the version pictured here. You can also use udon, ramen, or Chinese rice noodles, as long as you DO NOT overcook them. 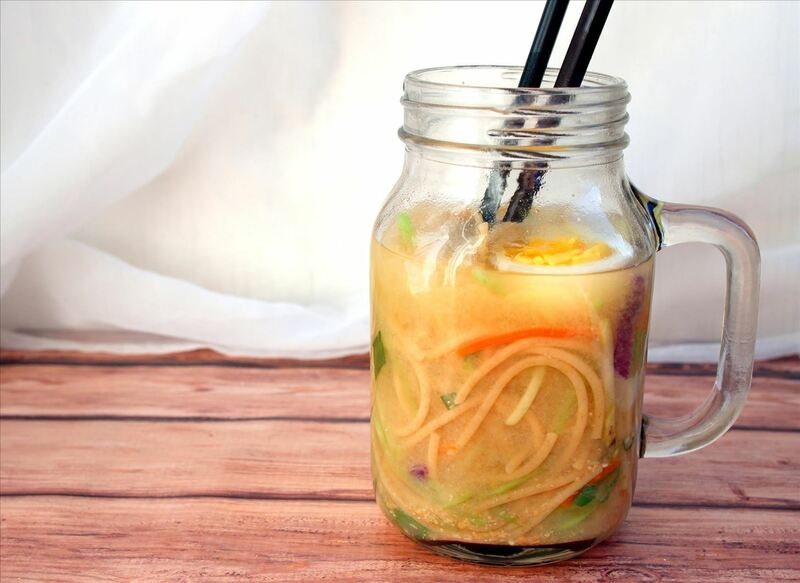 Instructions: Put ½ tablespoon of the miso with soup base into the bottom of your glass jar. Top with a layer of broccoli slaw about an inch thick. Press down lightly with a spoon. Add noodles, leaving about an inch at the top. Add hard-boiled eggs and scallions (if using) on top. To Eat: If you can, try to take your jar out of the fridge for an hour or so before you make this, so that the glass is not too cold. Pour just-boiling water into your cup o' noodles and cover top loosely. Let steep for five minutes. When ready, stir with a chopstick so the miso base is well-distributed. Enjoy! Instructions: Put 1 teaspoon of the Better than Bouillon soup base at the bottom of the glass jar. Top with spinach, pushing down the leaves lightly with the back of a spoon. Add precooked tortellini to the top. 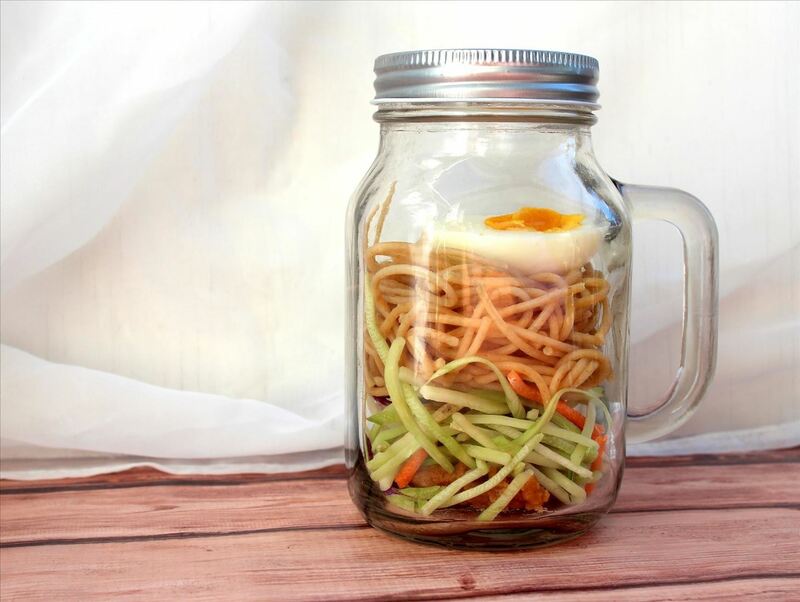 To Eat: Try to take your jar out of the fridge for an hour or so before you make this, so the glass is not too cold. 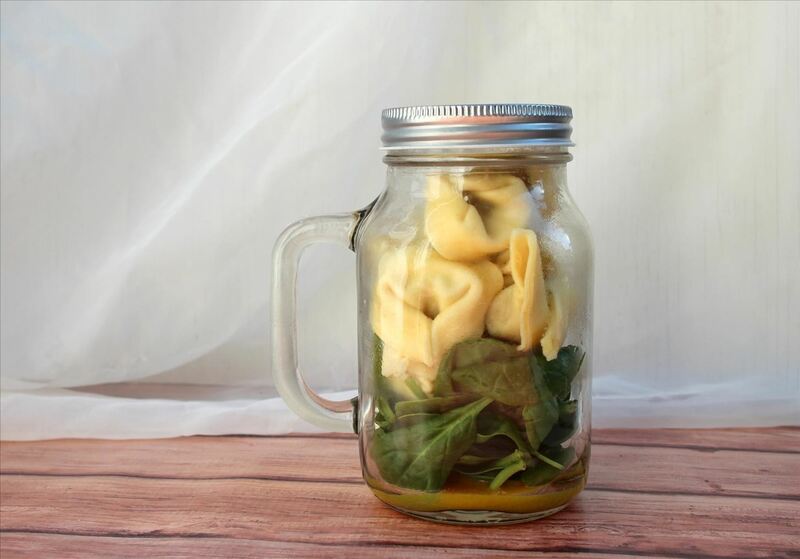 Pour almost-boiling water into your jar and cover top loosely. Let steep for five minutes. When ready, stir with a chopstick or long spoon so the soup base is well-distributed. Enjoy! For a vegetarian version with a lot of flavor, this recipe based on River Cottage Veg's pot soup has a nice base with garlic, ginger, and soy sauce. It's a colorful, tasty combo of vegetables and quick-cooking egg noodles. If you love Korean Shin Ramen, here is an at-home version by Serious Eats that is full of chili pepper and flavor. 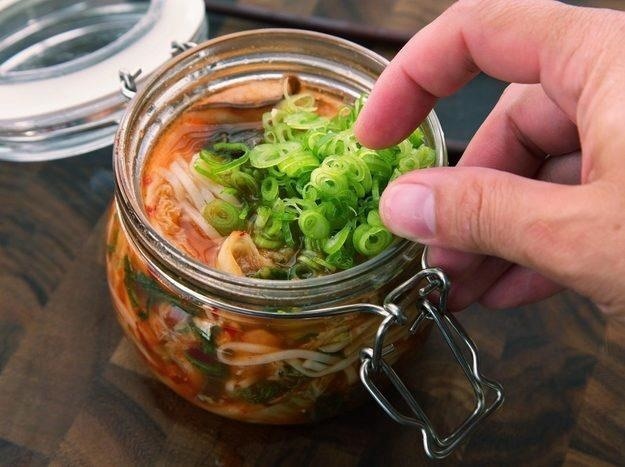 If you have kimchi at home, then it's a great addition to your soup bases to make a spicy noodle soup. 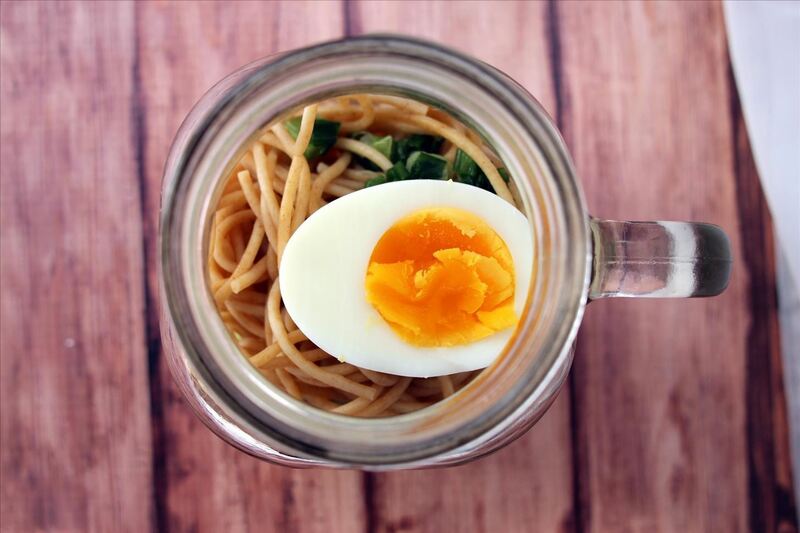 For lovers of instant noodles, there are a lot of ways you can use them for healthier, tastier meals. Here are 5 simple tips to upgrading instant noodles and ways to turn them into spaghetti, pho, and shepherd's pie.